In large bowl, stir together all ingredients except dough until well combined. On work surface, unroll dough from 1 can; separate dough into 8 triangles. Top triangles with half of chicken mixture (remaining mixture will be used with second can of dough). For each bundle, fold 1 short corner up over filling to center. Bring long point up over filling; you will have a little tail. Pinch top to seal. 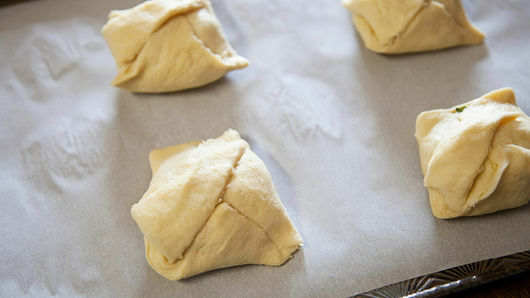 Fold remaining short corner of dough up over filling to center; pinch dough to completely seal filling inside dough to form of bundle. Fold tail over to top of bundle. Place on cookie sheet. Repeat with second can of dough and remaining half of chicken mixture. Bake 12 to 15 minutes or until lightly browned. Remove from oven; cool 2 to 3 minutes. Serve warm. Canned chicken is a perfect pantry item to stock up on. 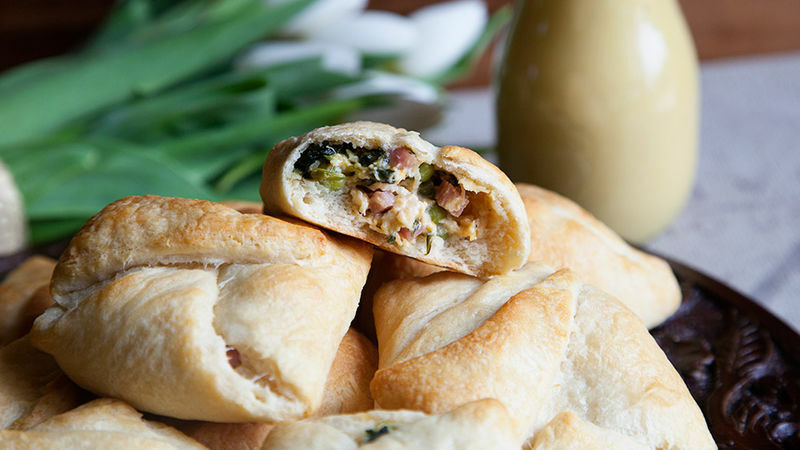 It works really well in baked items such as these Honey Mustard Chicken Pockets and it’s perfect for chicken salads as well. Here is a handy tip for draining your spinach. 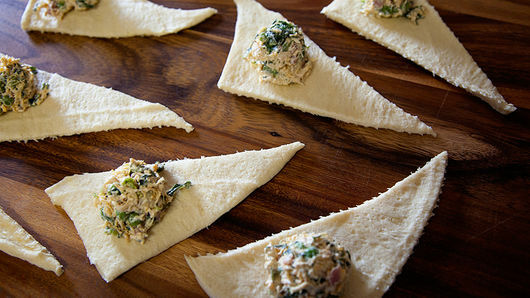 Layer two or three paper towels, place thawed spinach in the center of the towels and then gather up the four corners. Gently twist the paper towels to wring out the excess liquid over a bowl or the sink.